Document from the State Record Office (Andrew Bradley top entry). I first discovered Andrew Bradley following an email from Peter Lutley of the SAS Historical Research Centre. He had been researching Colonel Joseph Alexander Campbell for whom the Campbell Barracks, HQ of the SAS in Swanbourne, Western Australia had been named. Peter came across a file in the State Records Office which he thought would be of interest to me (1). Apparently in 1906, HM Indian Government offered pensions to any survivors of the Indian Mutiny who were in old people’s homes and asylums in the care of the WA Colonial Government. How Campbell became involved in this isn’t clear, but word went out and lists of veterans in care were sent to the Colonial Secretary’s Department. How and why these lists ultimately included veterans of not only the Indian Mutiny but the Crimean, Maori, China, Egypt and even Boer wars is also a mystery. From my point of view it added ten more people (most of them convicts) to my Crimean War Veterans’ database. The names of these men are mentioned in a newspaper article entitled ‘The Roll of Fame’ (2). 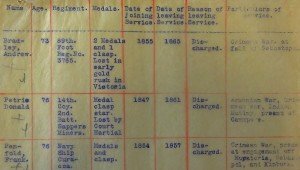 Bradley’s entry on this file recorded him aged 73, 89th Regiment #3765 who had ‘lost two medals and a clasp in the early gold rush in Victoria’. Not too early, as he is recorded in the SRO document as joining the service (Army) in 1855 and discharging in 1865. It is further noted that he was in the Crimean War at the fall of Sevastopol. 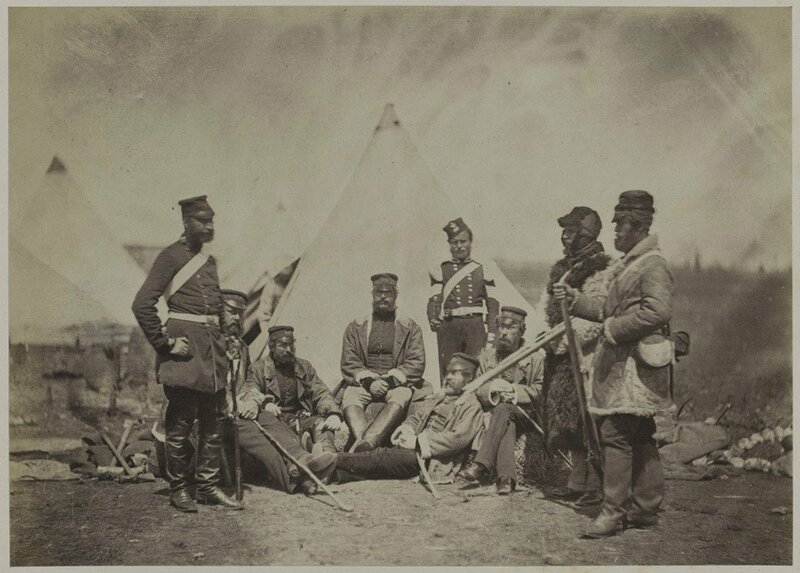 The regiment spent 1831 to 1854 garrisoning Gibraltar, the West Indies, Canada and Britain, before being sent to fight in the Crimean War where it served at Sevastopol. In 1855 the 89th moved to the Cape Colony, fighting against an uprising by the Xhosa, before moving to Bombay in 1857 for service during the Indian Mutiny (3). No WO97 Chelsea Pension records are extant, but records to substantiate Bradley’s claim can be found in the Medal Rolls (4) and in a Muster Roll of 1861 where he is recorded as being stationed in Umballa, India (5). He would have been awarded the Crimea War Medal with a clasp for Sevastopol and a Turkish Crimea Medal. Andrew Bradley probably discharged from the Army in India in 1865 as he is to be found arriving in Melbourne on 24 Mar 1866 from Calcutta on the barque Aurifera (6). 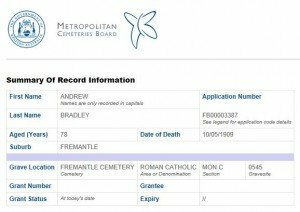 How and why Bradley made his way to Western Australia is unknown. He turns up again in the Western Australian Directory of 1898 as the caretaker of the government dam at Woolgangie, Boorabin. There is no record of him being married or having children in Western Australia. Death and Burial Record, Fremantle Cemetery. 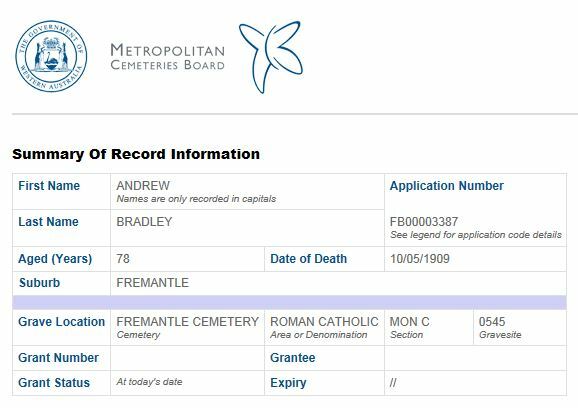 There are no discrepancies in the records of the date and place of his death and burial: he died in Fremantle on 10 May 1909 and was buried at Fremantle Cemetery on 11 May 1909 in the Roman Catholic Area, Section MON C, Gravesite 0545 (7). However, the discrepancies are in his age at various points in the records. We will probably never know exactly when and where this veteran of the Crimean War was born (1828-1837), only that when he finished his soldiering, he went from gold digging to dam caretaking. (1) Military Veterans Residing in the Colonies, Record Series 675, Cons. 752/1919/2479, State Records Office, Western Australia. (2) Daily News 15 Feb 1907. (3) National Army Museum UK website. (4) Crimean War Medal Rolls WO100-32 folios 402 & 406, National Archives, Kew. (5) Q2 1861 Muster Roll WO12-9148, National Archives, Kew. 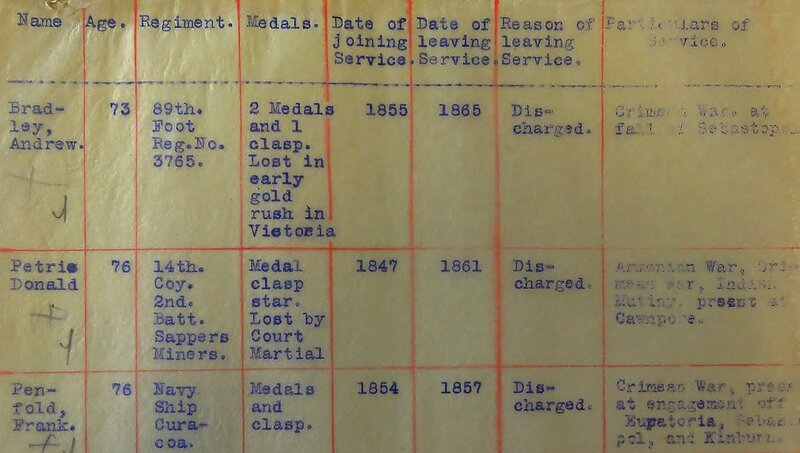 (6) Assisted and Unassisted Passengers Lists for Victoria 1839-1923. (7) Metropolitan Cemeteries Board & Church of Latter Day Saints familysearch databases.